As the scion of the merchant seafaring family that settled along the South Jersey shore, Richard Somers was the great-grandson of John Somers, the family patriarch. He was born during the American Revolution, on Sept. 15, 1778, at his father’s home and tavern at the corner of Bethel and Shore Roads. A small historical stone marks the place today. Other monuments honor him at the old schoolyard in Somers Point as well as at the U.S. Naval Academy at Annapolis, Maryland. Somers first learned to sail as a boy on Great Egg Bay and attended the Philadelphia Free Academy where he met his life-long friend and cohort, Stephen Decatur. Decatur, Somers, and Charles Stewart, all academy schoolmates, were fond of fist fighting in the old Quaker cemetery near their school. Later, they enlisted in the Navy together. Somers and Decatur board the frigate USS United States, built at the South Philadelphia shipyard by Joshua Humphries and commanded by Capt. John Barry, the "Father of the US Navy." As Midshipman, Decatur won a duel of honor with a French officer and Somers it is said, engaged six fellow midshipmen over an alleged insult. Duels were scheduled every hour beginning at noon. Somers was wounded in the one of the first three duels, and shot the fourth challenger while kneeling on the ground and assisted by Decatur. The other two conceded and declined to duel. 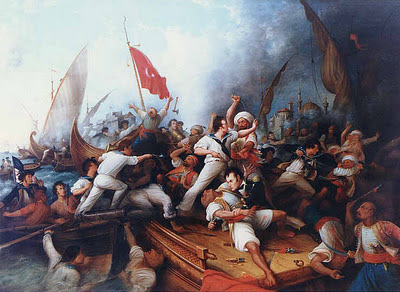 In 1804 the most prominent tyrant and chief thorn in Jefferson’s side was Libya’s Bashaw, Yusuf Karamanli, the Arabian gadfly of his day.Since the U.S. had won its independence from England, the efficient warships that displayed the well-respected Union Jack no longer protected American merchant ships. The Stars-and-Stripes that flew over U.S. merchant vessels only served as a welcome mat for marauding pirates that roamed the Atlantic Ocean and Mediterranean seas. The Tripolitians had captured over a dozen American merchantmen. 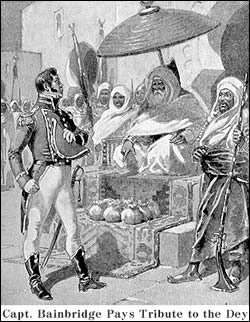 The United States and other countries had previously paid money, which was called “tribute,” to the various Arab monarchs of the North African Barbary Coast to keep them from intercepting the unarmed merchant ships. But when the tributes stopped, the piracy continued, often without much public interest. Then an American merchant seaman survived the ordeal of capture and enslavement and wrote about it, forcing Congress to order a new fleet to protect our ships at sea “Millions for defense, but not one cent for tribute,” was the slogan that began the tradition that the U.S. military is built upon today. 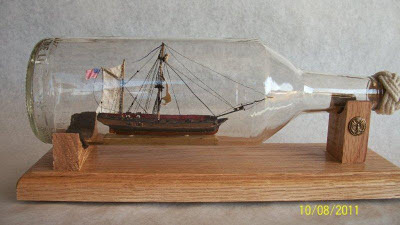 The Navy commissioned a number of small, quick schooners that could match the pirates’ corsairs in both speed and firepower, while the people of Philadelphia contributed two large frigates, the USS United States and the USS Philadelphia. Young Richard Somers, after serving as a midshipman with Decatur aboard the United States, made the grade of Lieutenant, and was given command of one of the new schooners, the Nautilus. His first assignment was to the Mediterranean with dispatches to recall the existing fleet commander. The Nautilus, and the rest of the Mediterranean squadron now were under the command of Commodore Edward Preble, the oldest Captain and lowest ranking fleet commander in the U.S. Navy. Preble quickly made his presence in the Mediterranean known. 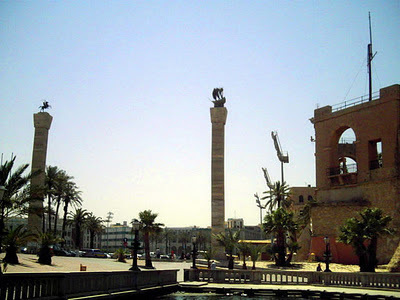 He sailed into the harbor of Algiers, the first Arab capital city he came to and paid his respects to the sultan. Although less radical than his Libyan counterpart, the Moroccan Sultan Muley Soliman was hesitant about renewing a neutrality treaty with the United States when other, less powerful countries like Libya, were easily appropriating American ships and their valuable cargo. Preble had his fleet, including the Nautilus, aim their guns at the Sultan’s castle, then went ashore with Tobias Lear, the new Counsel General to Algiers. Preble refused to surrender his sidearm or kneel before the Arab prince, who threatened to hold him hostage. Preble responded, “If you presume to do so my squadron, in full view, will lay your batteries, your castle and your city, in ruins.” The sultan capitulated and reaffirmed a treaty that offered no payments of tribute and left the merchantmen unmolested. Capt. Bainbridge deals with the Bey. Preble had sent the frigate Philadelphia ahead of the rest of the fleet to establish the blockade of Tripoli Harbor, but before he could relieve his battleship, disaster struck. The Philadelphia ran aground on an uncharted reef while chasing a Tripolitian corsair making for the safe haven of the harbor. Although the 300-man crew had thrown all the cannons overboard and tried to scuttle their ship, they were surrounded and were taken prisoner. The pirates had captured a vessel equal in size and firepower to Preble’s own flagship. While politicians began negotiating for the release of the 300 sailors who were being held in the dungeons of the Tripolitian castle, Preble prepared for action with the rest of the fleet. Enroute to Libya Lieut. 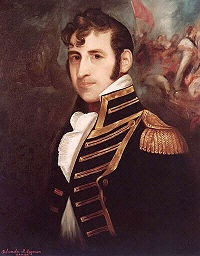 Stephen Decatur, skipper of the schooner Enterprise, captured the lateen-rigged pirate ship, Mastico. Built by the French for Napoleon’s Egyptian expedition and given to the Libyans as tribute. A U.S. navy officer’s sword from the Philadelphia was found aboard. Rechristened the USS Intrepid, she sailed into one of the most extraordinary and daring raids ever attempted by the United States Navy. Decatur first laid out his plan on the chart table in the stateroom of Captain Preble’s flagship at Malta. 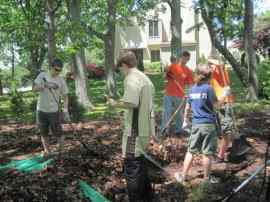 Then with Preble’s approval and a call for volunteers, he put it to action. After sailing ahead of the fleet for two days in stormy weather they arrived at Tripoli at night. Under the full moon of February 16, 1804, the Intrepid sailed into Tripoli Harbor with a full complement of crew, nine officers, fifty blue-jacketed sailors, eight marines and an experienced Sicilian pilot, Salvatore Catalino. As an American spy, Catalino had already been into the harbor, so he knew the position of the Philadelphia and the deployment of the enemy forces. With Decatur and Catalino on deck dressed as Moorish traders, they sailed within a hundred yards of the Philadelphia before the pirates hailed the Intrepid to stay clear. Catalino said he had lost his anchor in a storm and requested permission to moor alongside the Philadelphia until morning. Permission granted, lines were passed to the Tripoli guards and the Intrepid moved in. An alert guard, however, saw an anchor on the Intrepid’s deck and realized it was a trick. 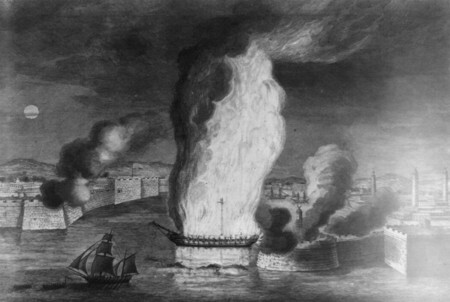 Decatur, aboard the Intrepid, destroys the captured frigate Philadelphia in Tripoli harbor. With the Philadelphia destroyed they still had the rest of the Tripolitians fleet to contend with. 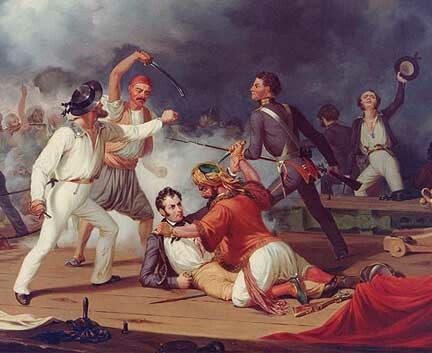 The Tripolitian navy, led by Irish-American turncoat Peter Lisle, were known as fierce fighters, at their best when the battle got down to a hand-to-hand knife and saber fight. The Americans took advantage of their firepower and sailing ability. Preble had his frigate, the USS Constitution, four brigs, the Argus, Siren, Vixen and Scourge, eight gunboats and mortar ketches, and the schooners Nautilus and Enterprise, commanded by Somers and Decatur. 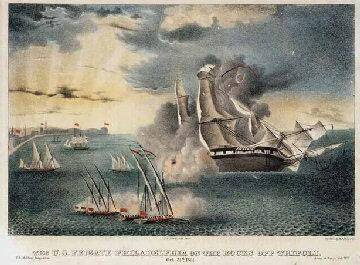 On August 3, 1804, while the larger ships engaged the shore batteries, Decatur and Somers each led flotillas of gunboats against the Tripolitian vessels. Decatur went up against five enemy vessels, boarded them against odds of two-to-one, and won the battle in 10 minutes. Reubin James saves the life of Decatur as he wrestles with a Tripoli pirate captain who had killed his younger brother after surrendering. Preble then agreed to another covert action for the Intrepid, this time with Somers in command, which if successful, would have destroyed the remaining ships of the Libyan fleet. In retrospect, it seemed ill advised, but if it had succeeded it would be considered another bold and heroic action. Somers and his volunteers rechristened the Intrepid the Inferno, and were to sail her back into Tripoli Harbor, only this time it would be converted into a fire ship, packed to the brim with explosives. Set under sail in the direction of the anchored enemy fleet, they were to light a 15 minute fuse and escape the Inferno in two rowboats. Before leaving on his mission Somers took off a gold and black ring, cut it in thirds and gave his former schoolmates, Decatur and Charles Stewart each a third. Preble, Decatur, and the rest of the fleet then watched as the Intrepid sailed off with Somers and his men, 11 volunteers and a stow-a-way sailor, who became the unlucky thirteenth crewman. They sailed off, into the night, never to return again. The war history reads: “They waited for more than one hour. Then the black harbor mouth was split wide in a blinding flash, and the roar of a great explosion rumbled out. What had happened? No one knows for sure. Perhaps the premature explosion was an accident. 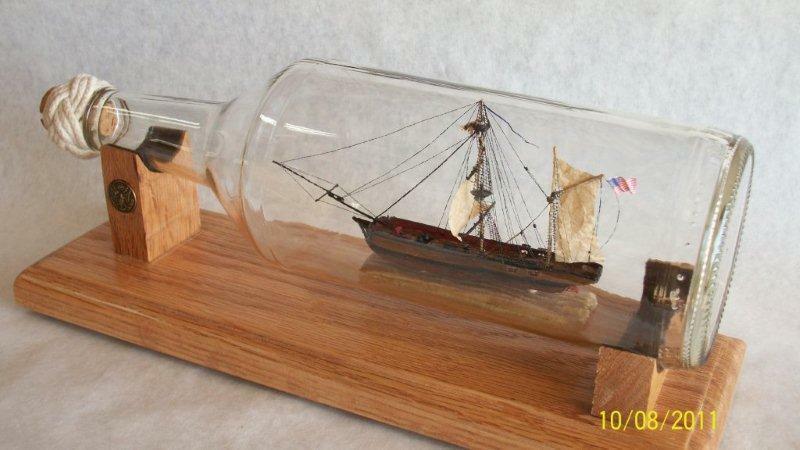 More probable -- and this was the opinion of Preble -- the Intrepid was assailed by Tripolitian guard boats and Somers, as he had declared he would do, simply hurled a lighted lantern into his magazine and blew his ship up.” The next morning 13 bodies washed ashore. Prisoners from the Philadelphia buried them "one cable's length" from the walls of the old castle fort at what is now Martyrs Square. Preble’s boys won the battles against the pirates, and were about to take Tripoli when the prisoners of the Philadelphia were freed through a truce negotiated with George Washington's secretary Tobias Lear. Preble returned home and was surprised at the hero's welcome he received in New York, Philadelphia and Washington, where Congress had a coin medal struck in his honor. Stephen Decatur later assumed command of the Mediterranean squadron, won the war, returned home a hero, and was picked to win the presidency, but was killed in a pistol duel over a point of honor. His home, the Decatur house, near the White House in Washington D.C., is a national historic landmark. Somers has always been memoralized so he will never be forgotten. There have been at least six US naval warships named after him, as well as the town of Somers New York, where his bust stands at the veterans cemetery. Somers' name is also on the Tripoli Monument at the US Naval Academy in Annapolis, Maryland, and there is a monument to Somers at the New York Avenue School and a picture display in the Somers Point Council Chambers. The grave of Richard Somers, his officers and five of his men now lies under a parking lot outside the walls of the old castle fort at what is now Martyr's Square. There have been periodic, though unsuccessful attempts to have the bodies of Lt. Richard Somers and his men repatriated home for proper reinterment, and a Congressional resolution, passed by the House of Representatives is now being considered by the Senate as part of the 2012 Defense Authorization Act. 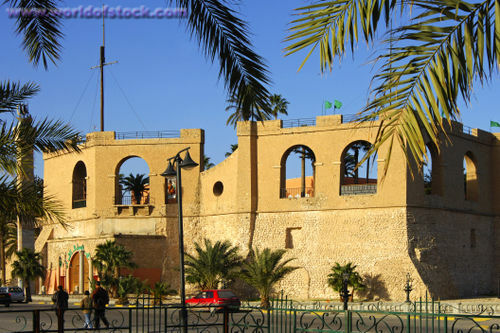 Eight of the officers and men of the USS Intrepid are buried outside the walls of this old castle fort in Tripoli. They died in the explosion of the USS Intrepid in September 1804. Thanks to the efforts of Rep. Mike Rogers (R. Mich) and Rep. Frank LoBiondo (R. NJ), the House of Representatives passed an amendment to the 2012 Defense Authorization Act and the Senate is now considering the resolution that calls for the repatriation of the remains of the men of the USS Intrepid from Tripoli. This is a summary of the amendment now being considered by the US Senate. The Secretary of Defense shall take whatever actions necessary to exhume the remains of any deceased members of the Armed Forces of the US buried at the mass burial sight containing the remains of any deceased United States Sailors located n Protestant Cemetery in Tripoli, Libya and the mass burial site containing the remains of eight Untied States Sailors located near the walls of the Tripoli Castle in Tripoli, Libya. The Secretary of Defense will transfer the remains to an appropriate forensics laboratory to be identified. In the case of any remains that are identified, transport the remains to veterans cemetery located in proximity, as determined by the Secretary , to the closest living family member of the deceased individual or at another cemetery determined by the Secretary . For any member of the Armed Forces whose rains are identified, provide a military funeral and burial. In the case that any remains not be identified, transport the remains to Arlington National Cemetery for interment at the Tomb of the Unknowns. Five of the men were reburied nearby at Old Protestant Cemetery. 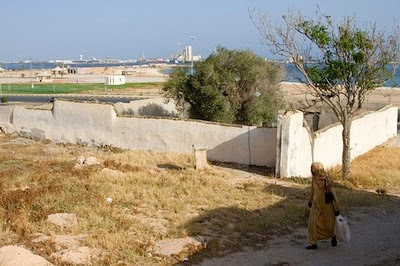 Tripoli harbor in the background. 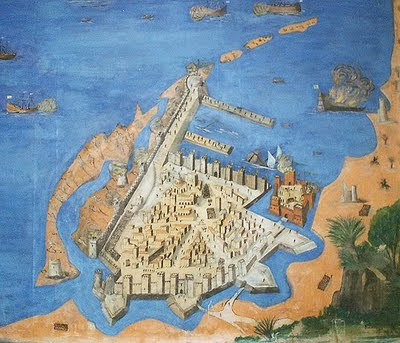 This old map of Triopli shows the old city, the old castle fort, that is now a museum, and the burning of the frigate USS Philadelphia and the ketch USS Intrepid in Tripoli harbor. Green Square, Tripoli, where eight US military heroes are buried, has been renamed Martyrs Square since the revolution. The only martyrs buried there are Master Commandant Richard Somers, Lt. Henry Wadsworth (uncle of Longfellow), Lt. Joseph Israel and five volunteers of the US Navy. More than 200 years ago, they were hailed as heroes. Navy Master Commandant Richard Somers and a dozen volunteer crewmen sailed an explosives-laden Intrepid toward an anchored pirate fleet in the harbor of Tripoli, Libya. The ship blew up before completing its 1804 mission, killing all aboard, and the sailors' remains were recovered and buried there. They were never brought home. But the death last week of ousted Libyan strongman Moammar Gadhafi has given fresh impetus to local efforts to repatriate Somers, a Somers Point, N.J., native and former University of Pennsylvania student, along with his crew. An amendment to the National Defense Authorization Act calling on the defense secretary to "take whatever steps may be necessary" to return the remains overwhelmingly passed the House of Representatives in June. It's now before the Senate, and if passed could help speed the process. The effort follows two 2004 New Jersey Assembly resolutions that sought the same outcome. "We have members of our military lying in a faraway country," said Jack Glasser, the mayor of Somers Point, who is a veteran and retired police captain. "We just want to bring the crew home; it's time." Glasser has been working on the return with U.S. Rep. Frank LoBiondo (R., N.J.), who cosponsored the congressional measure, and Dean Somers, a distant relative of Richard Somers' who lives in Galloway Township. Generations of the Somers family have tried, along with state and federal legislators and officials, to gain Libya's permission for the repatriation - with no success. "I think we have an opportunity," said Dean Somers, 66. "I am hoping [the Libyans] get a better leader than they had before, someone more friendly to the U.S. This is the closest we've been in 200 years." That feeling may be strongest in Somers Point. The Atlantic County town was named after the naval hero's great-grandfather, and residents there hold a Richard Somers Day celebration every September. The daring attempt to destroy the pirate fleet by Somers and his crew - like early Navy SEALs on a secret mission - captured the imagination of Americans. The explosion, the cause of which is unknown, foiled the mission. Six Navy ships have been successively named the Somers. The Bust of Richard Somers at Veterans Park in Somers, New York. The town of Somers in Westchester County, N.Y., also is named in the sailor's honor. 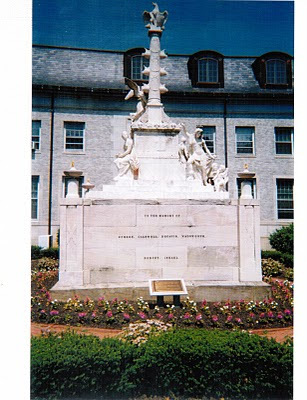 And Somers' name was placed on the Tripoli Monument, a white marble statuary at the Annapolis Naval Academy. The military memorial is one of the oldest in the United States. Locally, efforts are under way to raise money to build a monument at Somers Point, where Somers can someday be laid to rest. 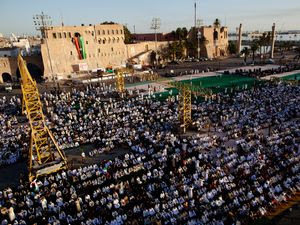 In the meantime, though, eight of the 13 sailors remain interred beneath Green Square in Tripoli, where Gadhafi followers once gathered in support of their embattled leader. Nearby are the graves of five more, in the shade of olive trees at a tiny, walled cemetery that overlooks the harbor. Their return would become a higher Defense Department priority if LoBiondo's measure is included in the Senate's version of the National Defense Authorization Act, said the congressman's spokesman, Jason Galanes. "We're hopeful that the new [Libyan] government looks more favorably upon" the efforts to return the remains, Glasser said. "There's definitely more hope now that Gadhafi is gone. "It's the right thing to do," he said. "Bring this crew home. It's been 207 years." Last Memorial Day American flags were placed at the five marked graves at the Old Protestant Cemetery near Tripoli Harbor. The eight others are buried in an unmarked grave under the parking lot at Martyrs Square, outside the walls of the old castle fort, where they were buried in September, 1804. 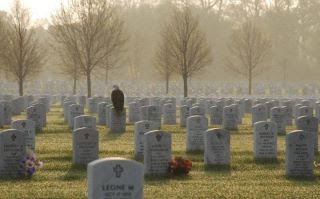 The US Senate is considering an amendment to the 2012 Defense Authorization Act that has been passed by the House of Representatives that calls for the repatriation of the remains of these men so they can be reburied in their home town or at Arlington National Cemetery, where plots have been reserved for them. Our Navy and the Barbary Corsairs (Houghton, Mifflin and Cmpany, The Riverside Press, Cambridge, 1905), there was some serious debate in political circles over whether the United States should build a Navy to fight the Barbary Pirates or pay them tribute. Apparently, at least at first, John Adams favored a policy of peace and payment of tribute, as he wrote to John Jay, Dec. 15, 1784, but he later supported the idea that if we must fight, the United States form a NATO-like coalition with sympathetic European nations to fight the pirates together. Of course the cost of building a Navy and the increase in taxes that would require became an issue. "The bill passed the House by a vote of fifty to thirty-nine. Its passage, however, was only made possible by the insertion of a provision that in case of peace with Algiers all work on the frigates should stop. Having passed the Senate, it was approved March 27, 1794. The law authorized the President “to provide, by purchase or otherwise, equip and employ, four ships to carry forty-four guns and two ships to carry thirty-six guns each;...This legislation is of special interest and importance because it marks the beginning of the present navy, the Revolutionary navy having been allowed to lapse completely. 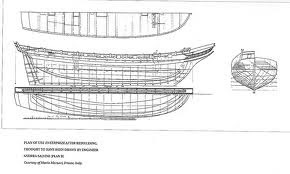 The work was well begun, and the selection of Joshua Humphreys, a shipbuilder of Pennsylvania, to design the ships, was a most fortunate one. He was a man of exceptional ability, and his views as to the type of ships most suitable at that time showed great wisdom." These ships, launched the following year, were the United States, Constitution and Constellation. They were the first of a long and honorable list containing many famous men-of-war, and the two last are still on the Navy Register. The frigate USS Philadelphia was one of the first ships built and sent to fight the Barbary Pirates. It was under the command of Capt. William Bainbrige, who lived in Philadelphia. William Bainbridge was born in New Jersey in 1774, and entered the navy as a lieutenant in 1798, having been in the merchant service since the age of fifteen. He was made a captain in 1800 and given command of the frigate George Washington, of twenty-four guns, a vessel which had been purchased in 1798...sent with tribute to Algiers, where she arrived in September 1800, being the first United States man-of-war to enter the Mediterranean. This was a duty very repugnant to Bainbridge, as it must have been to any naval officer appreciating keenly the inglorious attitude assumed by his country towards barbarians. Nov. 1, 1803 Captain Bainbrige, of the captured frigate USS Philadelphia, wrote to Commodore Preble that: "Misfortune necessitates me to make a communication the most distressing of my life; and it is with deep regret that I inform you of the loss of the United States frigate Philadelphia, under my command, by being wrecked on rocks between four and files miles eastward of the town of Tripoli." 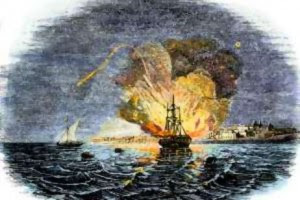 Lt. Stephen Decatur successfully completed the first part of the order and destroyed the Philadelphia in Tripoli Harbor, while Master Commandant Richard Somers perished in the explosion of the USS Intrepid while trying to carry out the second part of the order. In the meantime, William Eaton had been appointed consul to Tunis in July 1797...Born in Connecticut in 1764, and at the age of sixteen enlisted in the Continental Army. After the war he taught school, graduated at Dartmouth College in 1790, and two years later was appointed a captain in the army. December 22, 1798 he embarked on the US brig Sophia, 12....to Egypt where he met with former Bashaw of Tripoli Hammid Karamanli. In Egypt, Eaton convinced Hammid Karamanli to seek a return to power in Tripoli by overthrowing Yousef with the help of the United States. With Sgt. Presley O'Bannon USMC, a small contingent of Marines, a company of Greek Christians and a cavalry of Bedouin Arabs, they marched across the desert and like Lawrence at Akaba, attacked the coastal town of Derna from the unprotected land side. After taking the town, and successfully defending against a loyalist counterattack, Yousef Karamanli agreed to a peace treaty with US counsel Tobias Lear. Yousef freed the American sailors from the Philadelphia, but remained in power in Tripoli, thus betraying our ally Hammid Karamanli. Eaton, O'Bannon and Hammid escaped Derna aboard a US Navy ship and for his friendship, Karamanli gave O'Bannon his Mamaluk sword, which is now the dress sword of the USMC. A few years later, when the Barbary Pirates broke the treaties that ended the first war against the Barbary Pirates, Stephen Decatur successfully led the American Squadron in the Second Barbary War. Decatur was said to be considered as a Presidential candidate, but he was killed in a pistol duel of honor. 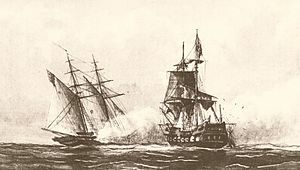 But in the end, the United States had a Navy that distinguished itself in the wars against the Barbary Pirates and continues today to fight pirates off the coast of Afria in ships that include the USS Bainbridge, the USS Sterret and the USS Barry, named after the Father of the US Navy, John Barry, and senior mentor to both Charles Stewart, Richard Somers and Stephen Decatur. The schooner USS Enterprise, commanded by Lt. Sterrett, was the first American ship to engage the Barbary Pirates, taking on the corsair Tripoli in a one-sided battle that left the pirate ship destroyed. Later, under the command of Lt. Stephen Decatur, the Enterprise captured the pirate ship Mastico, which was rechristened the USS Intrepid, and used by Decatur to sink the captured US frigate Philadelphia and by Richard Somers on his last mission into Tripoli harobr, where he remains today. 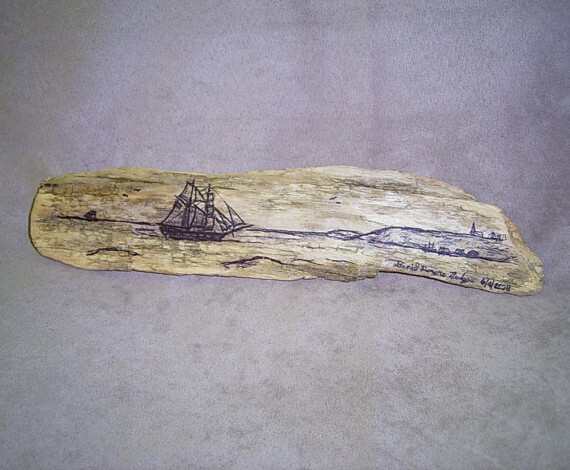 “The Schooner Enterprise 1799” A “Salty Seascapes Driftwood Drawing” by Daniel Revere Hedges. 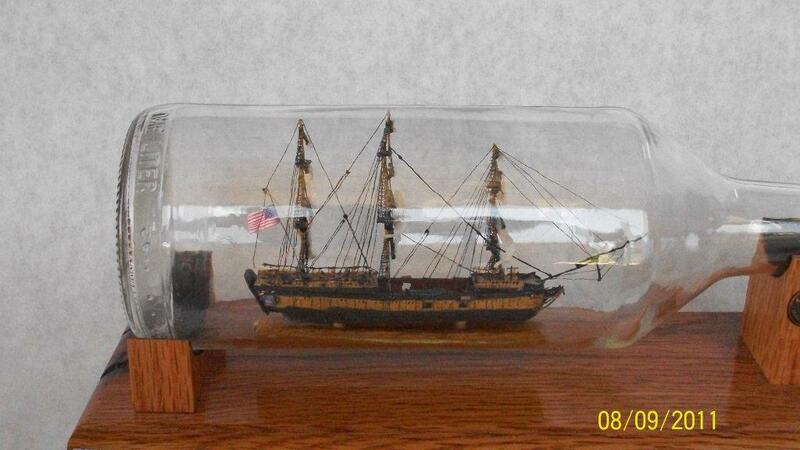 From “Cavalier Creations.” The 1799 U.S.S. 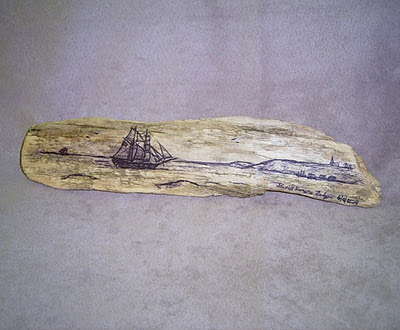 Enterprise, off the American coast, has been drawn into the surface of a piece of genuine driftwood gathered from the shore of Connecticut. The piece is signed by the artist and measures roughly 12" x 3" x 3/4"
After Lieutenant Shaw, due to ill health, was relieved by Lieutenant Andrew Sterett, Enterprise sailed to the Mediterranean. Being delayed by getting new masts, she left Baltimore in early May 1801. Raising Gibraltar on 26 June 1801, where she was to join other U.S. warships in the First Barbary War. Enterprise's first action came on 1 August 1801 when, just west of Malta, she defeated the 14-gun Tripolitan corsair Tripoli, after a fierce but one-sided battle. Unscathed, Enterprise sent the battered pirate into port since the schooner's orders prohibited taking prizes. On 23 December 1803, after a quiet interval of cruising, Enterprise joined with frigate Constitution to capture the Tripolitan ketch Mastico. Refitted and renamed Intrepid, the ketch was given to Enterprise's commanding officer, Lieutenant Stephen Decatur, Jr., for use in a daring expedition to burn frigate Philadelphia, captured by the Tripolitans and anchored in the harbor of Tripoli. Decatur and his volunteer crew carried out their mission perfectly, destroying the frigate and depriving Tripoli of a powerful warship. Enterprise continued to patrol the Barbary Coast until July 1804 when she joined the other ships of the squadron in general attacks on the city of Tripoli over a period of several weeks. Enterprise passed the winter in Venice, Italy, where she was practically rebuilt by May 1805. She rejoined her squadron in July and resumed patrol and convoy duty until August of 1807. During that period she fought 15 August 1806 a brief engagement off Gibraltar with a group of Spanish gunboats who attacked her but were driven off. 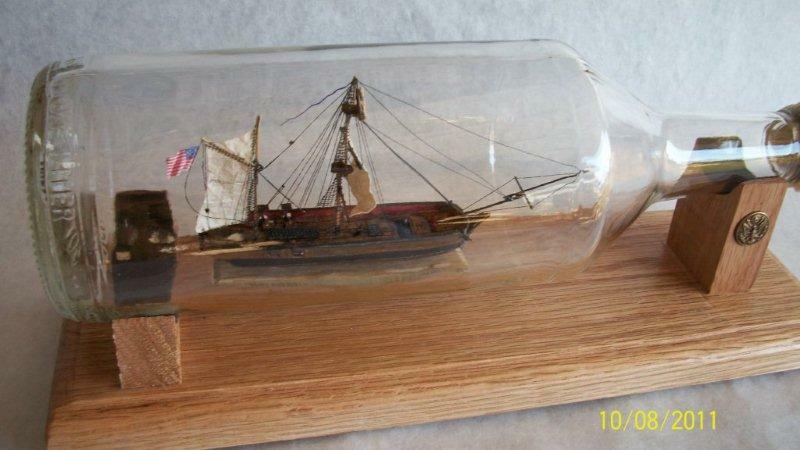 Enterprise returned to the United States in late 1807, and cruised coastal waters until June 1809. After a brief tour in the Mediterranean, she sailed to New York where she was laid up for nearly a year. The Ketch USS Inrepid ship model in a bottle was recently completed by Carl Dunaway, of Arkansas. This model is bound for the Intrepid Air and Space Museum in New York, where our friends from the Intrepid Veterans association hope to hold the official repatriation ceremony aboard the air craft carrier when the remains of the Intrepid crew are finally returned home. Carl Dunaway notes: "You wouldn't believe the research problems I had with this vessel. I ended up turning to the professionals at various museums including Oxford because of the confusion I found. Basically I found only two pieces of art that have been accredited. 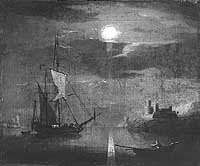 One was a painting by Brooking in the 1800's..."
The dark colored Brooking drawing (right, done years later, shows the Intrepid entering the harbor at night under a moon. Dunaway: "...and the other was a sketch done by Midshipman William Henry Allen at the top of a piece of paper that was his report to the Intrepid's demise. The U.S. Navy has both of them." The contemporaneous sketch by Midshipman William Henry Allen was probably done from the Constitution, as noted in Rembering Richard Somers: Naval Martyrdom in the Tripolitan War (Robert E. Cray Jr. in The Historian, Vol. 68, Summer, 2006). Son of a Revolutionary War army officer, Navy Lt. William Henry Allen was born in Providence, Rhode Island and appointed a midshipman in the United States Navy on 28 April 1800. He later served on the George Washington, Philadelphia and United States. He was wounded in combat during the War of 1812 while commander of the USS Argus in an engagement with the HMS Pelican. 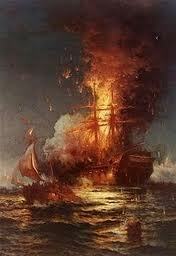 The Argus, was one of the ships that had waited hopefully for the crew of the Intrepid to row out of Tripoli harbor. It was taken as a prize by the British. As Chris Dickon notes in his new book The Foreign Burial of American War Dead (MacFarland, 2011), Allen was the first American to be properly buried on foreign soil with full military honors in the churchyard of St. Andrew's, Plymouth, England on 18 August 1813. Allen is quoted as having said, "It is better for civilization to be going down the drain than to be coming up it." 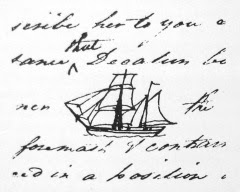 While the Navy may have a copy of Allen's sketch, Gregory Guderian (NJ Latin Inscriptions Project) refers to the sketch as coming from the, "Drawing of the ketch Intrepid, in a letter of 1804. (Papers of William Henry Allen, mss AN 51, The Huntington Library, San Marino, Calif.)"
Carl Dunaway also notes: "The confusion was in the painting it shows the Intrepid lateen rigged and in the Allen sketch it shows her with a full gaff sail. Had to find out which was which. It turned out that James Cheevers at the U.S. Navy solved the problem. She was both. 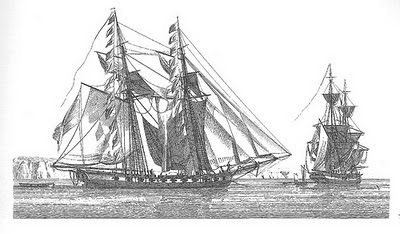 On the initial report of the Mastico's capture it was noted that she was lateen rigged but when she returned from repairs at Syracuse she was gaff rigged. That's why I did her as gaff rigged." 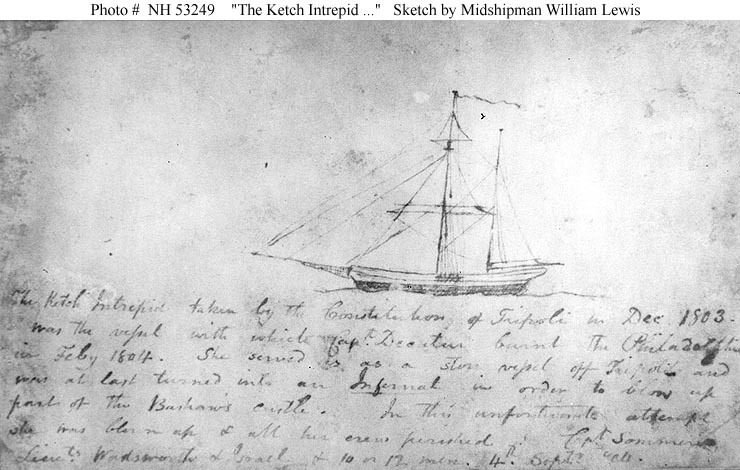 Below is a third sketch of the Intrepid, also apparently contemporaneous, by Midishipman William Lewis, who is listed among the officers assigned to the frigate U.S. Constitution, Commodore Preble's flagship, serving with Midshipman Joseph Israel, who would die on the Intrepid. Carl also did a model of the frigate USS Philadelphia (36), which was sunk in Tripoli harbor during a daring February, 1804 night time raid led by Lt. Stephen Decatur aboard the Intrepid disguised as a pirate ship, which it once was. 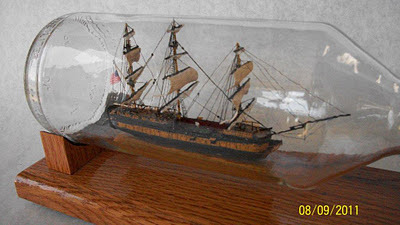 The frigate Philadelphia, one of the largest ships the United States sent to Tripoli, ran aground while chasing a pirate corsair into the harbor. The ship, Captain Bainbridge and its 300 man crew were captured and held for ransom in the dungeons of the old castle fort. When the Intrepid exploded in Tripoli harbor on Sept. 4, 1804, the bodies of the 13 man crew washed ashore and were buried outside the walls of the old castle fort by Dr. Cowdery, the chief surgeon of the Philadelphia and other prisoners. Remains of both ships - The USS Intrepid and the USS Philadelphia remain in Tripoli harbor. Ed Wilson, the former CIA official who lived in Tripoli in the 1980s, said that when he inquired about the wrecks he was told that they had been covered over with cement, which should act as a preservative for any future nautical archaeologists who want to look for them. Cannon from the Philadelphia should still be buried in the sand along the eastern shore of the harbor where both ships were taken by the tides. Jim Delgado, who discovered the wreck of the second USS Somers, a Midshipman training vessel that sunk off Vera Cruz, Mexico, is interested in locating the wrecks of the Intrepid and Philadelphia and making a documentary film about it. His expedition was postponed by the earlier breakdown in US - Libya relations. Since that situation has now changed, maybe these wrecks can be located and some artifacts retrieved. "In March 1938 President Franklin D. Roosevelt requested the Navy to take 'any reasonable means available' to locate and identify the graves of the Intrepid’s crew. Burchis, Mustapha, and Johnson, Arthur M., Resting Place of Heroes of the Barbary Wars (Proceedings, U.S. Naval Institute, Annapolis, Sept. 1956, 969-973). The presence of American naval power in the Mediterranean today is a constant reminder to would-be aggressors of the importance of that vital area to the United States. Our Navy protected American interests there in the early years of our country’s independence, and it is prepared to do so again should the need arise. A mute but impressive testimonial to this enduring determination to keep the sea lanes of the Mediterranean open is a peaceful cemetery on the outskirts of Tripoli. In 1949 it was officially recognized as the resting place of five of the American sailors lost in the explosion of the U.S. Ketch Intrepid in 1804. The background of that incident of the Barbary Wars is a fascinating one in itself. Discovery of the graves, located after nearly a century and a half of neglect, is another intriguing tale, for it was the result of unrelenting detective work by an Arab who was determined to solve the mystery, whatever the cost to himself. In the following pages an attempt has been made to present both aspects of the Intrepid’s story as an integrated account. The Intrepid, originally a French gunboat, had an interesting history. Seized by Barbary pirates and renamed the Mastico, she fell into American hands when she was captured by the Enterprise in December, 1803. 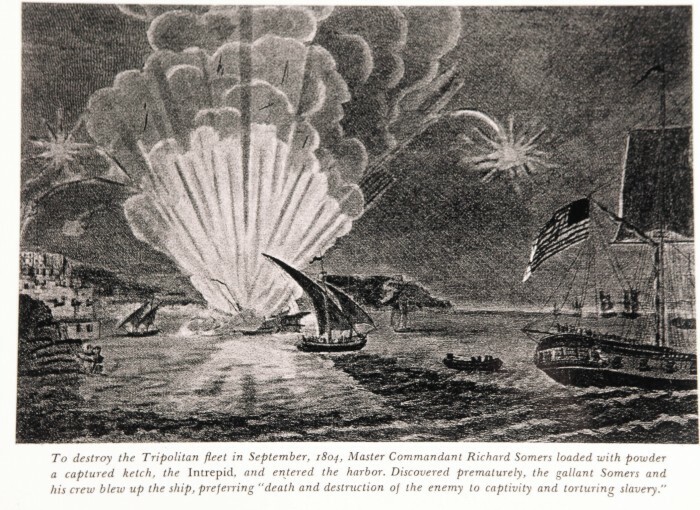 The preceding October the ketch, under Tripolitan colors, had taken part in the attack on the frigate Philadelphia, which was driven ashore and then salvaged by the pirates. Because of her Mediterranean rig, the Intrepid was, by a twist of fate, selected to carry out the mission of destroying the Philadelphia in the harbor of Tripoli. Under Stephen Decatur, this assignment was successfully executed on the night of February 16, 1804. No member of the Intrepid’s crew was killed, and only one was even slightly injured. When an occasion for a similar expedition arose the following September, the Intrepid again seemed the most suitable vessel for it. This time, however, the carefully laid plans went awry. Commodore Edward Preble had proposed sending a fire-ship into the harbor, where it was to explode amidst the enemy vessels. To this end the Intrepid was loaded with 15,000 pounds of powder in bulk, and above it was massed as much shot and shell as there was room for. A train was laid from the powder compartment aft to a space filled with combustibles. Having reached a favorable position in the harbor, the crew was to set fire to the combustibles and escape in two boats carried for the purpose. Lieutenant Richard Somers of the Nautilus volunteered to lead the raid. He was joined by Lieutenant Henry Wadsworth, uncle of the poet, and by Midshipman Joseph Israel, familiarly known as “Pickle,” who reportedly stowed away in one of the Intrepid’s boats in order to share in the adventure that was to cost him his life. Ten seamen from the Nautilus and the Constitution formed the remainder of the crew. Somers was fully aware of the dangers confronting his little band. Before departing, he broke his ring in three pieces, giving one piece to Lieutenant Charles Stewart, another to Decatur, and keeping the third himself. He also gave Decatur his will. About 9 P.M., September 4, 1804, the Intrepid set sail for her rendezvous with destiny. She was convoyed as far as the rocks at the harbor entrance by the Vixen, Nautilus, and Argus, which stood by to pick up the Intrepid’s boats upon the completion of her mission. As the ketch stood in toward the mole, she was lost in view from the convoying vessels but provoked the fire of Tripolitan shore batteries. Suddenly, Lieutenant Stewart of the Brig Siren believed that he saw a light moving on the deck of the Intrepid. When it disappeared, there was a tremendous explosion, a sheet of flame, and then all was quiet. Recalling the event many years later, Stewart was sure that what he had seen was a torch being applied to the Intrepid’s deadly cargo in an effort to prevent the vessel’s capture by the Tripolitans. No one knows with certainty, however, exactly what caused the premature explosion which ended the Intrepid’s career and snuffed out the lives of her gallant crew. Reportedly the Bashaw offered a dollar for each body recovered, and, according to some accounts, thirteen of them were brought in. Of these, two badly mangled corpses were found in the wreckage of the Intrepid, one was in the boat that was to have carried them to safety, four were floating in the harbor, and six drifted ashore on the beach to the southeast of the town. 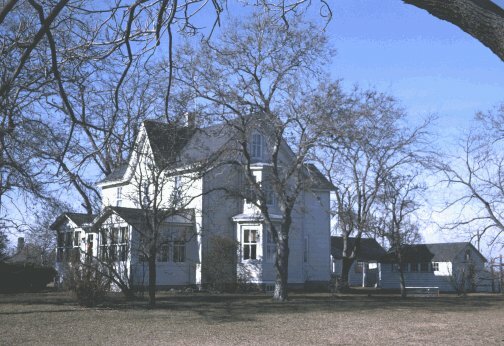 An American witness declared that he himself had seen fourteen bodies and heard of six more. If this report is true, the theory that Tripolitan gunboats attempted to board the ketch may have some validity, especially as Commodore Preble declared that the largest of the Tripolitan gunboat was missing and three others, badly damaged, were seen beached the day following the abortive raid. The credibility of the witness who declared that there were fourteen bodies is further enhanced by the fact that he identified three of them as officers by the softness of their hands and the remnants of their clothing. According to one report, the bodies of the three officers were buried in the same grave “about a cable’s length to the southward and eastward of the Castle.” The ten seamen were said to have been laid to rest “on the beach,” but the beach and the location of the graves were soon lost to memory. The question of their whereabouts did not arise as a subject for on-the-spot investigation until 1938. In March of that year President Franklin D. Roosevelt requested the Navy Department to take “any reasonable means available” to locate (and) identify the graves of the Intrepid’s crew. "any reasonable means available" to locate (and) identify the graves of the Intrepid's crew. The assistance of the State Department was requested in this matter, and the Embassy in Rome in August, 1938, provided the Department with two reports on it. However, no further action seems to have been taken by the American government at that time. How the graves were discovered by a Tripolitan drawn into this search by accident, and how they finally came to be officially recognized by the United States Government, is the subject of the following narrative. Because of its simple eloquence, it is presented substantially as the author, Mustapha Burcis, wrote it. I first heard in May, 1938, of the five graves of the American sailors who died in the explosion of the Intrepid. At the time, Italy ruled my country and I was a “marshal” working with the Tripoli Port Authorities. The rank of “marshal” was equivalent to Sergeant Major and it was the highest rank a Libyan could get in the Italian Armed Forces. As head of all Libyans employed at the Port, I had a great deal of influence and the Italians often used my services in collecting and finding information. One day Colonel Pumo, Port Commander, called me into his office. Port Captain Mario Battaglieri was also there. The Colonel showed me a message from the American Embassy in Rome, requesting any available information that might lead to the discovery of the whereabouts of the graves of the American sailors killed in the explosion of the Intrepid in 1804. Even if no information were available, the Embassy agreed to pay for any search made. That day I went home with big dreams and great ideas. I thought of myself as the discoverer of a hidden secret, a secret of heroic death. I dreamed that the American Government would take me to America, and I would be a great man. America was a dream to me, a dream of wealth and freedom, and now I had my big chance of having it come true. I discussed the problem with my family, relatives, and friends. They all thought that I was crazy and asked the same question, “How can you find the graves of people who died and were buried in 1805” (sic). “Yes, how?” I asked myself, and I had no answer. However, against everyone’s advice I decided to take a chance and try. In this decision my wife stood by me and gave me all encouragement and help. For me this was a chance to make a dream come true. Besides the fact that those sailors were killed in 1804, I knew nothing on the subject. Thus my first logical step was to read about its history in order that my steps might be guided in finding the secret that had been hidden for almost one hundred and fifty years. The Italian authorities in Tripoli had many libraries which I visited day after day, after my work, to read the history of the Barbary Pirates. Having saturated myself with the history, I turned my attention to the problem of getting information about the dead sailors. This took me to the following possible sources. The first was Suleiman Bey Karamanli, who gave me permission to use his private collection of books, publications and manuscripts. This collection yielded no information to me because a large number of the publications were in Turkish, which language I do not know. I was forced to get translators who could help me. The Castle Library was of great interest but yielded no new information. However, my constant trips to the Castle aroused the interest of an old guard who in his quiet manner daily inquired about my health and my studies; and in a longer conversation he accidentally mentioned municipality records and the Moslem Property Department records, saying that if I wanted any information of my missing relatives I could find something in those places, but not here. Following the old man’s wisdom, I carried my search to those two places. At the municipality I met another Karamanli who was head and mayor of the Moslem community in Libya. He gave me all the assistance I needed, but there were no records that went as far back as 1804. At the offices of the Moslem Property Department I met the Director, Ilmail Kamal, a Libyan historian well informed of Libyan history and events, but he knew nothing of the fate of the American sailors. Next, I visited the “Judge of Judges,” President of the Moslem Courts, Mohammed Burkhis, an old, learned man and one who gave the impression of never having lost his touch with the old customs and habits of the Bedouins. The stories he knew and had heard about the naval battles between Americans and Tripoli Pirates were numerous, and he told me of many ships that sank in Tripoli harbor and the many dead that were always found on the eastern shore of the city. The story about the eastern shore later turned out to be a fact, but at that point it had no significance to me. 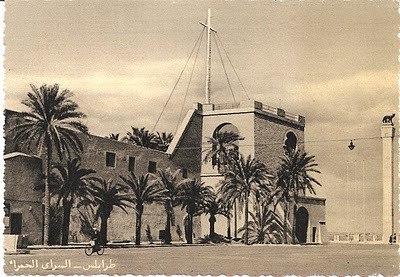 The Judge, however, indicated in his conversation that the Christian churches in Tripoli might know something of the fate of the Christian sailors. Seeing the wisdom of his suggestion, I got in touch with Monsignore Facchinetti, who gave me permission to look at their registers of the dead. Two Catholic brothers helped me during my short search of the Cathedral’s archives. During this time the brothers told me about Christianity and its greatness and way of life, trying to convert me to their religion. It was the first time I had heard about the infidel’s religion. I admired it and saw how near it is to ours because we also believed in One God and a moral life. The differences, I thought, were not important, and I remained a god Moslem. My work had so far taken me about three months. It got me no nearer to my goal, but I benefited from the study. I also became so interested that I resolved never to give up. The more I pursued the subject, the greater my interest became. Unable to obtain further information at the British Consulate, I went home as usual and felt like giving up all hope. By now all my friends and relatives thought I was foolish and unstable. My wife, as ever, was by my side, and I talked to her at great length of my work so far. I had not and was not expecting my wife to be helpful because women, to us, are busy at home and not interested in men’s problems. Suddenly she suggested that I go to Benghazi. “Maybe some one of them would know,” she said. Why I accepted the suggestion, I don’t know. Maybe [it was] because I was tired and wanted to go away. I cheered up and made ready to leave, taking time off from my work. Then came the problem of finance. My wife even sold her jewels to help pay expenses. My stay in the East proved only one point, that any information leading to definite facts had to be taken from old related stories. Back in Tripoli I got an afternoon off and [visited] Signor Andrea Farrugia at the Maritime Agent’s Office. Signor Andrea told me of the many stories he had heard told by the elders among the Jewish Community still living in the Old City. These stories told of the bodies that were buried on the east shore of the harbor. These constant references to the eastern shore convinced me that I should follow this line of research. Life in the old city and the ancient traditions made approach to the people difficult. A direct approach would get me nowhere, so I started getting friendly with people, spending afternoons sipping tea and smoking and exchanging stories. One of these old men was Hawoto Hatuma, almost one hundred years old at the time. He remembered his father telling him of great explosions in Tripoli Harbor in the year 1804, and great fires that kept the city excited for days. Those were of ships that burned in the harbor and resulted in many, many Americans sailors being killed. 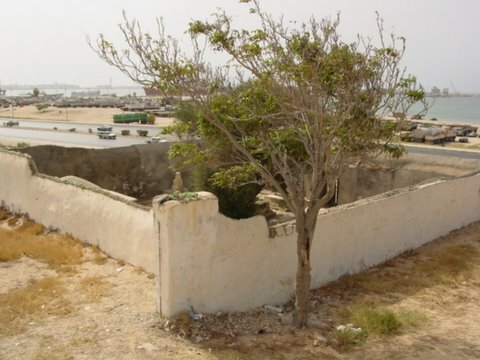 Those sailors were buried where they were found on the eastern shore of Tripoli. Hatuma then took me to the house of the aged. Here [sic] Shaloum Akub, who took me around and saw to it that I became a friend of the elder Jewish Community. The stated purpose of the visits was to have my fortune told. Over cups of tea and smokes my fortune was told time and time again. A great friendship developed between us, and stories were exchanged till the Intrepid story came up, and here my interest was at its greatest. Most of the people had heard stories from their fathers and grandfathers of the bodies of the American sailors that were buried on the eastern shores of the harbor exactly where the English cemetery is located. A Maltese seaman of about eighty-five remembered his father and cousin telling the same stories, and said that there were five bodies buried where the Protestant cemetery is now. This was further confirmed by “akka,” which means in literal translation, “bedbug.” Bakka was an astrologer and fortune teller. He was fairly sure that the British or Protestant cemetery was started because of the five unknown graves. The next day after work, I decided to make another visit to the British Consulate. During the morning Mohammed Zenturi, Port Pilot, was asking me whether I had learned anything in my quest, and we talked about the Intrepid. During the conversation I learned that currents in the port area are directed often to the eastern shore. Since the present seawalls did not exist at the time of the Barbary Wars, that could explain exactly how the bodies of the sailors could be washed to that location. In my mind, I became positive that the five unknown graves in the now Protestant cemetery were the graves I was looking for. Thus I returned to the British Consulate. My first question was when and how did the British cemetery start. It turned out that, in 1830, the wife of the British Consul in Tripoli, Mrs. Warington, died and that spot was chosen for burial. Why was that particular place chosen? After all, at the time it was a deserted, lonely place. The answer was, because there were already five graves there believed to be of Christians buried in the beginning of the century. I then inspected the cemetery and the graves, and some additional questioning confirmed to me the facts. I wrote my report in Italian. That was in 1939, a year after I first started my work. Inside the Old Protestant Cemetery. The war had already begun. My hopes fell soon after my report had been sent. Italy was an enemy of the United States in the war. What happened to my work, I don’t know. Almost ten years of war passed, and I forgot that work. However, my friends and relatives were convinced of the fact that, after all, Mustapha Burchis was not a fool, and he did discover the secret and had reached his goal. It was a memorable day for me when, on Monday, 21st of March, 1949, I went to the United States Consulate and gave them more information. Two days later, I was requested to meet Mr. Taft. I was informed that my information had been accepted as correct and that the U.S. Navy had decided on a ceremony on the 2nd of April to commemorate the death and burial of those brave sailors. Thus it took place that through hard and continuous work I discovered the graves of the five unknown United States sailors who bravely came to their death in the explosion of the Intrepid and whose graves are now a symbol of a period of history when the United States was at war with Tripoli. These graves are known now to all Americans who visit these shores, and a memorial ceremony is held every year. U.S. 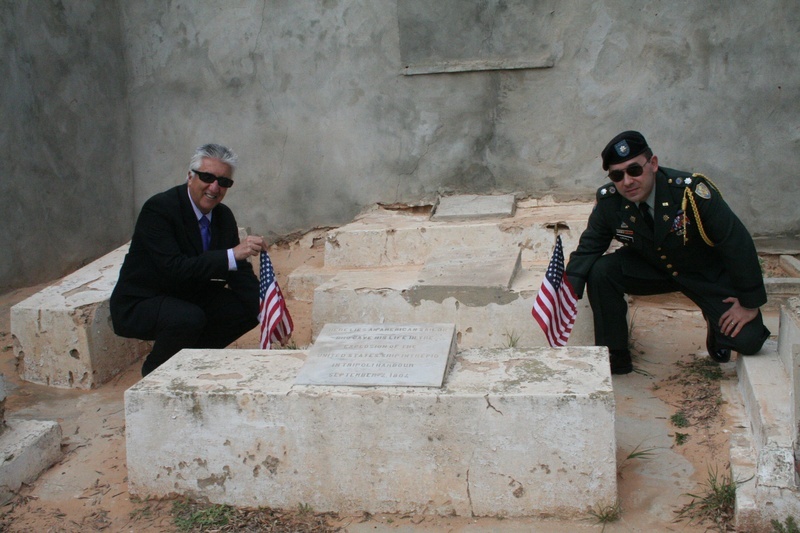 Ambassador to Libya Mr. Gene Cretz places American flags on the graves of the US sailors from the Intrepid at Old Protestant Cemetery in 2010. Mr. Taft confirmed the accuracy of the above narrative in a conversation with the co-author of this article in October, 1955. The Navy sent the Cruiser Spokane to take part in the services dedicating the ceremony. On that occasion Tripoli for the first time witnessed a parade by American naval personnel accompanied by an American Consul. Significantly, they came as friends honoring the memory of gallant predecessors whose graves had been located through the devoted efforts of a Tripolitan. MUSTAPHA BURCHIS comes from an old Moslem family which fought Italian colonization in Libya and kept on fighting. At the age of 12, he was taken prisoner during one of the many battles with the Italians, and was sent from Derma to Tripoli and put to work. He grew up amongst sailors of all nationalities – without any formal education, although he learned to read and write Italian and Arabic. Since 1914 he has worked at the port of Tripoli and was eventually promoted to the post of harbormaster and “marshal” or head of all the Libyans employed by the Tripoli Port Authorities of the Italian Armed Forces. ARTHUR M. JOHNSON, assistant professor in the Department of English, History and Government at the U.S. Naval Academy, did the editing and rewriting of Burchis’ manuscript, adding pertinent historical material while striving to keep something of the flavor of the author’s original style. SHAFIC IBRAHIM is a Lebanese teacher of English employed by the U. S. administration in Libya. The plan was for the bomb-laden Intrepid to be steered toward Tripoli harbor, for her crewmen to light the powder train and escape, and for the ship to explode, causing destruction of the enemy bashaw’s territory. The plan backfired. Negotiations had proved futile. 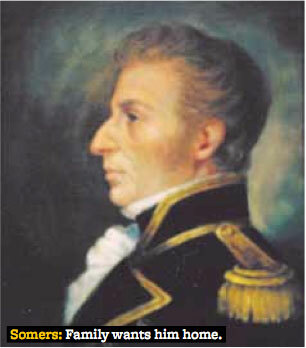 Commodore Samuel Barron and his four reinforcing frigates still had not appeared. The fighting season was rapidly ending. Commodore Edward Preble decided on a dramatic act to try to bring things to a head. In March, he advised the Navy Secretary that he intended to use a lot of powder to blow up the bashaw of Tripoli’s works; now he thought, was the time for it. Newly promoted Master Commandant Richard Somers was the fourth senior officer in the American squadron and had begun in the 1804 campaign in command of the 12-gun schooner Nautilus. A native of Somers Point, New Jersey, he had been in naval service since 1798, coincident with his longtime chums, Charles Stewart and Stephen Decatur, and with them initially had served on the United States, where he eventually became its third lieutenant. It was early in this tour that Somers felt compelled to duel six of his fellow midshipmen. Wounded in the arm in the first encounter and in the thigh in the second, Somers, seated and braced by Decatur, succeeded in wounding his third opponent. At that point, the remaining three declared honor satisfied and the affair ended. His only other service prior to commanding the Nautilus had been duty in the first American Mediterranean squadron on board the small frigate Boston. 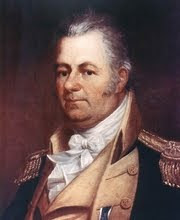 During this period, he saw Tripoli for the first time, but accomplished little else as his quixotic captain, Daniel McNeil, never reported to Commodore Morris for duty. McNeil was cashiered on the ship’s return to the United States. Decatur, Stewart and Somers were Preble’s principle subordinates in the current squadron. The little Intrepid, the 60-foot onetime transport for Napoleon’s Egyptian expedition and the former Tripolitan Mastico, after laying largely inert in Syracuse since her February escapade to destroy the Philadelpia, joined the squadron off Tripoli on 22 August. She was about to perform her last service to her country of capture. On 29 August 1804, Preble ordered his carpenters to maker her over into an “infernal,” a gigantic floating bomb. First, they planked in the forward portion of the hold, making it a magazine. Into it was placed about five tons (100 barrels) of black powder in bulk. Atop this were laid 100 13-inch mortar shells and 50 9-inch shells, as well as an assortment of kentledge (iron ballast blocks), shot, and anything that would make a deadly missile. A wooden trough was run aft to another compartment filled with combustibles. A powder train was laid in the trough, connecting the combustibles to two 15-minute fuses run through musket barrels mounted in the magazine bulkhead and into the powder. The Intrepid was to be run in amongst the bashaw’s fleet, or even against the castle wall, the combustibles room having been lighted to give her the appearance of a fire ship. The powder train would carry the fire along to the magazine which, if the timing was right, would go off as planned, causing much destruction in its vicinity. 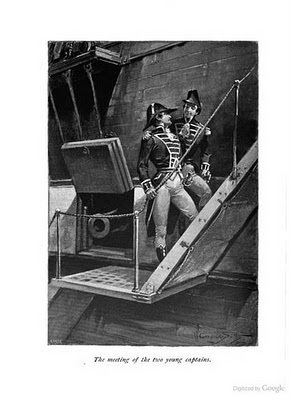 A small crew would be necessary to guide her in under the cover of darkness until she was headed fair for her target, when the combustibles would be lightened and the helm lashed, and the crew would depart in attending launches. Preparations in the Intrepid were completed by 1 September. Somers claimed her command as his chance for glory. Commodore Preble granted him his wish, displacing Acting Lieutenant Joseph Israel, who had overseen the ship’s preparation, for the duration of the operation. Newly promoted Acting Lieutenant Henry Wadsworth of the Constitution was the third officer, while four seamen from the Nautilus (Seamen James Harris, William Keith, James Simms, and Thomas Tompline) and six from the Consitution (Seamen William Harrison, Hugh McCormick, and Jacob Williams, Ordinary Seamen Robert Clark, Isaac W. Downs, and Peter Penner) completed her complement All were volunteers. The officers vowed that the only way the Tripolitans would get the powder was in a blast. At 2230, Somers and his volunteers manned the Intrepid, and a half hour later slipped her cable and bore down on the western entrance on a fair east-southeast wind. They were within about 400 yards of the entrance when the wind suddenly shifted south, taking the Intrepid all aback and making further progress impossible. Somers turned back, and at 0200 rejoined the squadron. Nobody in the port seemed to have been the wiser. The next drawing, as was their custom, the Tripolitan gunboats left their defensive line deep in the harbor and began moving as if to take up their usual daytime positions inside the rocks adjacent to the western entrance. Soon, however, they moved to new positions under the protection of the English fort to the east of the town and to windward of the normal operating area of the Americans. Preble appreciated the move, seeing that it gave the pirates the weather gauge (wind advantage) in the event the Americans deployed as they had previously. The commodore adjusted his plan accordingly, sending his gunboats to duel with their opposite numbers while the frigate and ketches worked over the castle and fortifications. It required the rest of the morning and a part of the afternoon for the brigs and schooners to town their gunboats to positions from which they could descend upon the Tripolitan flotilla at the eastern end of the harbor. AT 1430, the flagship signaled the attack and the two divisions went forward, one paying particular attention to the gunboats and the other to the English Fort and a new fortification slightly to its west, nicknamed by some the “American fort.” For the next two hours, the sides flailed away at one another without material result. To the west, Preble had sent in the bomb ketches to bombard the city. Taking positions more than a mile off, the two craft had their best day since the attack of 7 August. Out of 41 shells fired, 33 exploded in the town. Although both units suffered rigging damage from Tripolitan return fire, it was self-inflicted damage that put Number 1 out of action. Repeated firing of the massive mortar (and apparently inadequate repairs a few days earlier) resulted in the mortar bed giving way and hull timbers staring. She broke off firing with two feet of water in her hold. The ever-watchful Preble saw what was happening to the bomb ketches. Once more the Constitution spread her canvas high and wide and bore down on the offending batteries. Some 80 cannon opened at her as she came, raising sprouts of water all around her and sometimes throwing the spray even on the glistening canvas. At 1530 she came to, her port broadside fair on the town, and there she lay at three cable’s length for 40 minutes, crashing shot after shot into the pirate stronghold – more than 200 rounds this time. As on earlier occasions, the shifting wind necessitated the signal to haul off shore, which all units did without incident. Following a day of repair and resupply, Preble found the evening of 3 September right for the use of the infernal, the Intrepid. A light haze covered the surface of the sea, making visibility difficult beyond a couple of hundred yards, although the stars clearly were seen overhead. At 2000, Intrepid slipped her cable and headed for the port’s western entrance, just inside of which three Tripolitan gunboats were known to have taken their regular night station. She was towing two fast rowing boats, one each from the Constitution and the Nautilus, to be used in the escape from the time bomb. The Argus, Vison, Nautilus, and somewhat later, the Siren, all followed Somers’s dangerous craft. They would take up stations off the rocks to pick up the returning daredevils. Lieutenant George Washington Reed, Somers’s next senior officer in the Nautilus, was the last to speak to Somers as the escorts dropped away. He later reported that the “Intrepids” were calm, in good order, and determined as they parted company. Slowly, the Intrepid moved forward and disappeared into the haze. Some claimed to have seen her throughout what followed, but it seems more likely that her gradual disappearance left them convincing themselves they still could make out her form. After some moments, the Tripolitan batteries were seen and heard to open fire, a fire that seemed aimed at nothing in particular. About ten minutes after the shore batteries opened up, at about 2147, according to Sailing Master Nathaniel Haraden of the Constitution, there was a tremendous explosion and a burst of light. In an instant a fiery column flashed skyward. In it, some saw Intrepid’s mast rising straight up, trailing its rigging. So swiftly did the fire flash and ide that none saw the mast come down. From the point of explosion fountained burning shells arching across the sky in all directions and raining down on sea and shore alike. And then there was deafening silence, as both sides stopped in awe of what they had seen. Clearly, something had gone wrong. There had not been time for Somers to have gotten his craft to its destination before the explosion. The haze had prevented a sure knowledge of where the Inrepid was when she blew up. Still the American units waited off the rocks through the night with waning hope that their shipmates would come rowing out of the gloom as Decatur had done the preceding February. The Intrepid’s mast could be seen resting on the rocks just to the west of the entrance the next morning. Also there was what appeared to be a portion of her keel or bottom. Coincidently, three of the enemy gunboats seemed to be missing. Commodore Preble, with so few clues, concluded that Somers had been boarded, or at least cornered, bythe picket boats and that, true to his word, he fired the charge so that the Tripolitans could not get the powder. However, given the location of the wreckage at or outside the entrance, it does not seem likely that Somers got far enough to engage the gunboats. He probably missed the entrance in the poor visibility and went gently aground on the rocks on the west side of the entrance. In that vulnerable position, he may have been hit by a stray shot from one of the Tripolitian guns; or perhaps the jar of grounding set off the powder; or perhaps, in the confusion that must have occurred when she struck, someone aboard caused an accident or panicked. The next morning, Commodore William Bainbridge, the senior of the bashaw’s American prisoners, received permission to see the bodies. He and two of his lieutenants accounted for all 13; two bodies still in the wreck, ten floating in various parts of the harbor or washed ashore southeast of the town, and one in Constitution’s boat, which drifted ashore farther down the coast to the west. None of the bodies was recognizable; some were not all there. Somers’s remains were identified by his breeches. Those found on the beach subsequently were buried nearby, Bainbridge himself conducting the small service. Preble’s infernal had done absolutely no damage to the Tripolitans. The loss of personnel in this bizarre mode of attack stunned the squadron. The commodore himself deeply felt the loss. Preparations began anew the next morning for yet another attack, but without quite the drive that had characterized Preble’s earlier efforts. The loss of Somers and company and the frustration of his inability to bring the Bashaw to terms, combined with a spate of bad weather on 5 September, led the commodore to call of preparations and to make ready the bomb ketches and gunboats for a return to Naples. The season, he decided, was far too advanced to risk keeping the unwieldy craft on the open sea any longer. Late on 6 September, the John Adams, Siren, Enterprise, and Nautilus towed them offshore, on their way home. Barron and two frigates, the President and Constellation, were sighted at noon on Sunday, 9 September, and when they joined later that afternoon, Edward Preble hauled down his broad command pennant. Although he did not feel it at the moment, the months to come would prove how very successful he really had been. Early in the new year, shortly after Preble returned to the United States, Congress voted him a gold medal, swords for each commissioned officer and midshipmen (never delivered), and a month’s pay bonus to each of the sailors in his squadron. The 200 years since have seen ships bearing the names of a number of these officers and men serving in the Navy: six ships named for Somers, five for Preble, three for Sailing Master Trippe, two each for Lieutenant James R. Caldwell, Midshipman John D. Henley, and Seaman Reuben james, and one each for Acting Lieutenant Joseph Israel, Midshipman John S Dorsey, and Seaman Daniel Fraser. (Both James and Fraser were credited, at later times, with saving Stephen Decatur’s life in his first gunboat attack.) Midshipman Robert T. Spence, who persisted in firing his bow cannon even as Gunboat 9 sank under him and survived, also had a destroyer named for him. 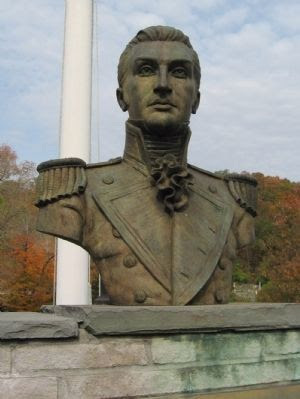 Neither Lieutenant James Decatur nor Acting Lieutenant Henry Wadsworth have been so honored, perhaps because each had a brother who was: Stephen Decatur and Alexander S. Wadsworth. Henry gained a remembered memorial, however, when his nephew was named after him: Henry Wadsworth Longfellow.